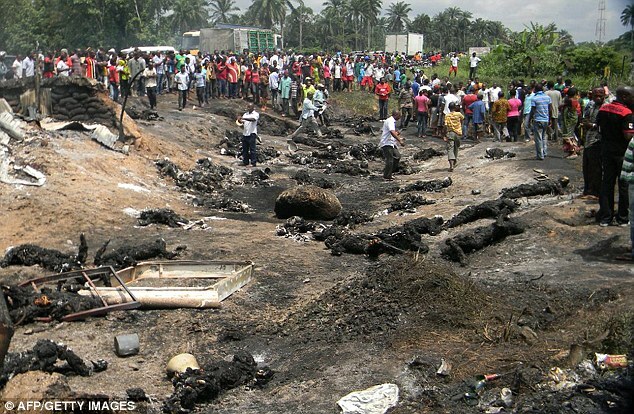 A petrol tanker crashed, caught fire and exploded in Nigeria yesterday, killing more than 100 people who had rushed to the scene to scoop up fuel that had spilled. 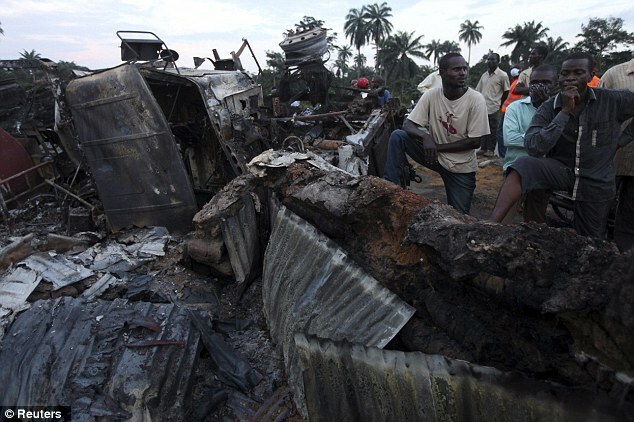 At least 50 others were injured in the incident in the southern Niger Delta region. 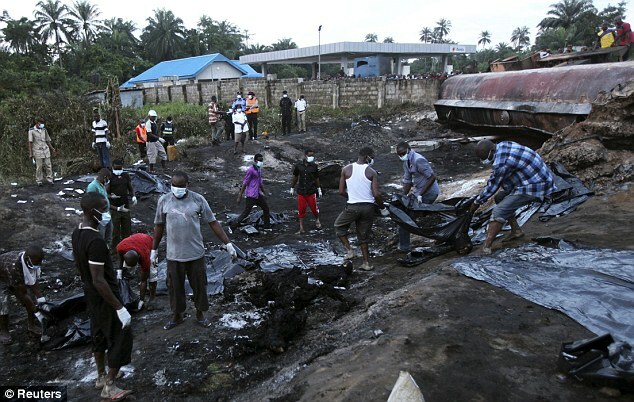 Witnesses said some charred corpses were still lying in the area hours after the explosion, including bodies the size of children. He said some women wailed at the scene of the explosion, desperately looking for their relatives. 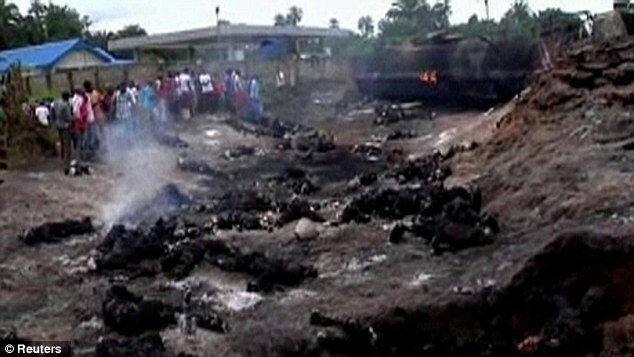 The location of some of the bodies suggested that the victims were trying to run away when fire consumed them. 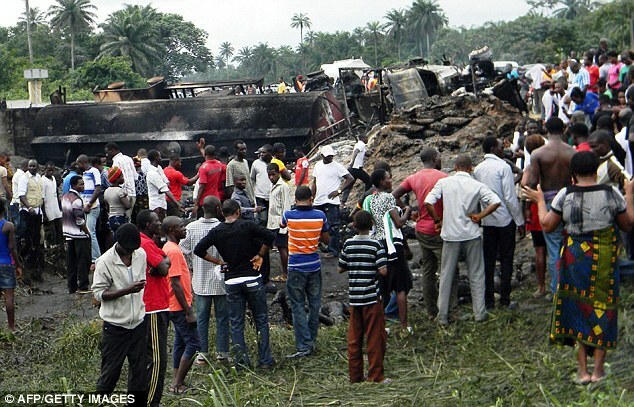 The tanker was trying to avoid a head-on collision with buses when it swerved into a ditch yesterday morning, said Rivers State police spokesman Ben Ugwuegbulam. It then overturned, leaving its fuel to spill and people immediately swarmed to the scene to collect some of it. 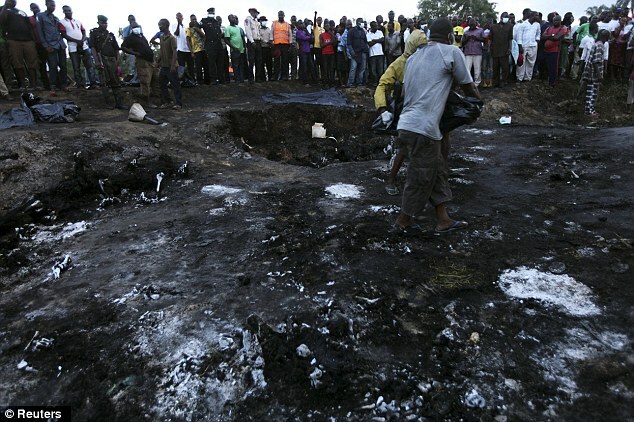 Yushau Shuaib, a spokesman for the West African country’s emergency management agency, said the 95 people were killed in the explosion that ensued. It was not immediately clear what had caused the fire that left the truck burned to ashes. Despite decades as an oil producing region, the majority of those living in the Niger Delta remain desperately poor and mostly without access to proper medical care, education or work. 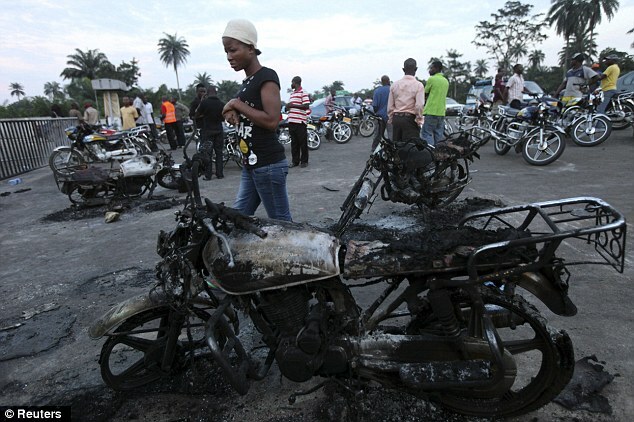 Anger over the situation on several occasions has driven young people to attack foreign oil firms based there and steal fuel from pipelines. The crude that flows from the Niger Delta is the lifeblood of Nigeria’s economy. The OPEC member now pumps out about 2.4million barrels of oil a day, making it Africa’s biggest producer. Production dropped drastically during the militant attacks that targeted pipelines and saw foreign workers kidnapped. A 2009 government-sponsored amnesty program saw many fighters lay down their arms and the violence largely stop. 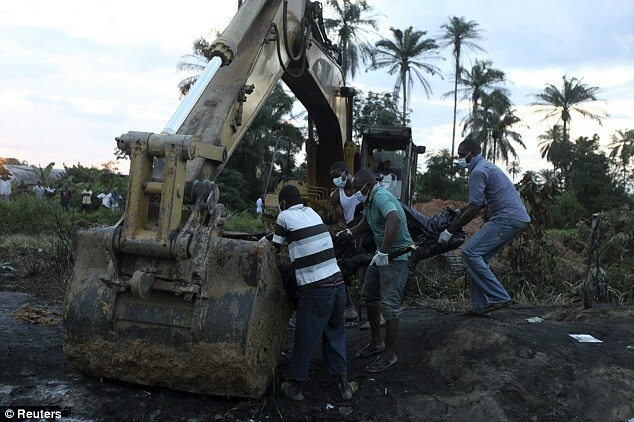 The truck accident took place near the town of Okogbe, about 40miles from Port Harcourt city, Nigeria’s oil capital in the delta – a region of swamps, mangroves and creek. A pipeline and a filling station were near the accident site, but neither was affected. 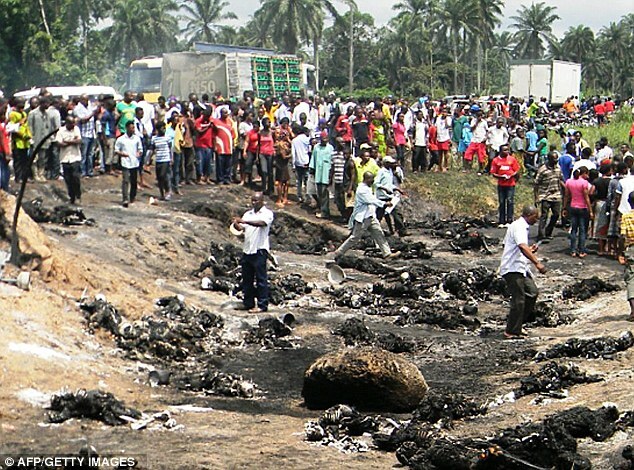 President Goodluck Jonathan said in a statement he is ‘deeply saddened by the loss of many lives’ caused by the explosion and ‘particularly distraught by the fact that once again, so many Nigerian lives have been lost in an avoidable fuel fire disaster’. A photographer who was at the scene said that the accident occurred on a major East-West highway that was being expanded. Construction workers, however, hadn’t yet reached the level where the accident occurred which remained a single lane, often forcing vehicles racing head-on to seek avoiding each other. Mr Alagoa said the accident ‘would not have happened’ if the road had two lanes there. At least two contracts have been signed over the last six years to expand the highway that runs through Niger Delta states, according to a government website. However, corruption often hinders or slows down road construction and maintenance projects. 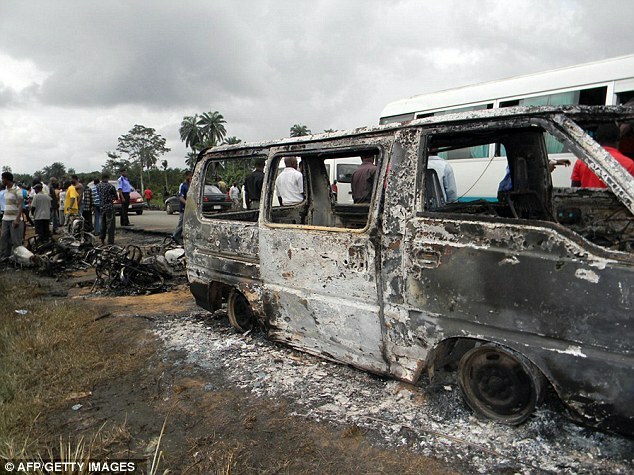 Accidents are also common on Nigeria’s poorly maintained roads. Drivers often travel at high speed and overtake slower vehicles, leading to head-on collisions with high death rates. ‘This tells a tragic story about the state of national infrastructure and the poverty of the people,’ said Nnimmo Bassey, executive director of Environmental Rights Action.